I’m trying to follow a new personal rule about Facebook responses: if mine hit two paragraphs, consider a blog post. 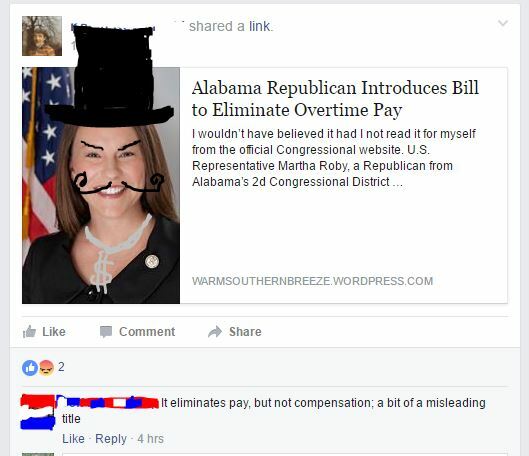 The potential elimination of overtime pay and a Facebooker’s promiscuous use of the term “misleading” lead me to this post. Here’s the news that prompted the Facebook post that I ultimately wanted to respond to. To the left of this paragraph is a screenshot of the original Facebook post and the comment that prompted this response, exactly as the post and comment appeared. The screenshot is a little small and I don’t intend for it to appear misleading, so please click for a more easily read view. Full disclosure: yes, that last bit was an outright lie. I blanked out the name of the commenter (using the unofficial colors of Labor Day) and the name of the original poster, because I don’t want to draw undue attention to anyone’s friends, even if they are posting on a public forum. And I did do the hat. But everything else is just as it appears in real life. Especially the mustache. I swear it on the Internet. Anyway, back to the Facebook post. There’s no “misleading title” there. The bill would eliminate overtime pay. That’s true, correct, factual and accurate. It takes no imagination, however, to foresee how this “compensatory” time might never be awarded by organizations that are (a) asking employees to work beyond a full week as we’ve defined it, (b) unwilling to provide extra pay for extra work, and (c) obviously unwilling to pay others to do the extra work they’re requiring their existing employees to do. There are no protections built into that bill to guarantee that the employees would ever get to use the time “given” by a company that won’t give them their already-normative time off. And that’s just a start to the problems that could result. That’s why a similar bill at the federal level got killed off in 2013 by the senate after passing the house. It keeps coming back, though, at the federal level: see this link and read to the end. The current overtime-pay headline speaks for itself, but it says a whole lot more. Misleading? I’m seeing a little feint, a little deception, but not where the accuser thinks. Deflecting attention toward the medium for its supposed shortcomings is an old trick for covering up the meaning behind the message delivered. Let’s face it: this is another attack on labor, pure and simple. It’s an attack on working people. It’s an attack on America. Author’s note: A too-quick reading of the original post made me mistake the effort by an Alabama congresswoman as a state effort rather than a federal one. I apologize for, and have corrected, the error. ← Darn right I had one. Wanna make something of it?